I was 11 when i was first put on my spectacle (oh the big one!). since then i have live with this very annoying blurry view everyday, well almost 15 years now!Using contact lens won’t help much, as i still have this uncomfortable feeling when i wear it more than 5 hours.Plus my working hours, which need me to keep facing the computer make it worst…urgh! Laser treatment? Hmmm…Will it actually be ok? I mean, whats the risk , how much it costs? Well who else to turn to if not my dear Google rite ..he he..
Ok, i google leser treatment…and i found this..LASIK.. I keep on reading and read one interesting sentence, iLASIK Video Contest…Well, if you love video making, maybethis is your chance! Well people, it worth trying..$5,000 for the GRAND Prize sounds good ey? Black Eyed Peas in Malaysia Ticket !! Hurray up people, its time to get PARTYYY!!! BEP will be perfoming live at sunway lagoon stage on 25th Sept 2009! get your ticket now, RM103 per ticket, just email me at jcbazil@gmail.com. Oh, i love MTV world stage just recently, and this one will be very fantastic as well!! Party is open to guests aged 18 years and above. ID verification will be carried out. Dress code: Black Party Chic. Back in 1993, when I first met Prince Abdullah at a dinner, I could never have imagined what fate had in store for me. At that time, as a recent graduate, I was living and working in Amman, and certainly never expected to marry a Prince of the Hashemite lineage or, one day, become the Queen of Jordan. Following the sad passing of His Late Majesty King Hussein, and the ascension of His Majesty King Abdullah, we were faced with enormous responsibilities and challenges. Fortunately, we had had a taste of public life in our roles as Prince and Princess, but still the adjustments to King and Queen were considerable. In fact, we are still learning. I think we always will. Many people are awestruck by the title of “Queen”, but for me, it is a job that incorporates several roles. Primarily, my duty is to partner His Majesty in his efforts to improve the standard of living of all Jordanians. While respecting our traditions, we are determined to build Jordan into a modern civil society and model for the region by ensuring sustainable levels of economic growth and social development. In addition, I work in areas related to child protection and family safety, women’s empowerment, the creation of opportunities for youth, and culture and tourism. Daunting? Yes. Impossible? No. In fact, such challenges energize me. Like a lot of jobs, it is often hard work but, equally, it is varied and interesting and provides privileged opportunities to meet a wide cross-section of society–both at home and abroad. As a working mother, juggling the demands of the job and four young children is not easy. Like all parents, I strive to achieve the right balance. My official activities take account of the children’s school day and their plans and programs, and extensive periods of time on overseas engagements are limited. Spending a couple of hours each night with the children doing homework or reading to them in bed gives them, and me, a sense of security. Being surrounded by them, grounds me and reminds me of what is important. I am now officially following Queen Rania on Twitter! i really adore her, and can’t stop myself by keep reading everything she wrote on her website, and i blog about it righ away! Woman fined in Sudan for wearing pants? KHARTOUM, Sudan – A Sudanese woman who wore pants in public was fined the equivalent of $200 but spared a whipping Monday when a court found her guilty of violating Sudan’s decency laws. 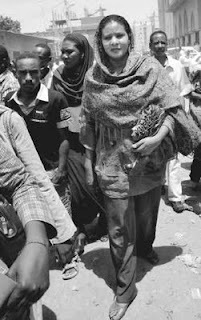 A defiant Lubna Hussein said she would not pay the fine and would take a month in prison instead to protest Sudan’s draconian morality laws. Manal Awad Khogali, one of her lawyers, said the judge hearing the case had called only police witnesses to testify and refused to allow Hussein – who has pledged to use her trial to bring attention to women’s rights in Sudan – to defend herself. “He didn’t give us a chance,” Manal said. After the trial was over, Hussein seemed defiant as ever. “I will not pay a penny,” she said. On Monday night, after refusing her lawyers’ advice to pay, Hussein was whisked off to jail, though her lawyers said that a committee formed for her defense may pay the fine and free her. Sudan is partly governed by Islamic law, which calls for women to dress modestly. But the law is vague. According to Article 152 of Sudan’s penal code, anyone “who commits an indecent act which violates public morality or wears indecent clothing” can be fined and lashed up to 40 times. Hmmmmmmmm….Go Lubna!! ..Gosh, i mean….WHATS WRONG WITH WEARING PANTS??????? I don’t have enough time to go outside and having the fun to shop in a ‘real’ shopping complex…I am tied with my work day and night..
Another virtual shopping mall i found just now is She-Tech and it’s really cool! Its more on Chic-Tech shopping online, where you can find a lot of cool accessories for working women…Not doing any promotion or so so here…hehe..but hey why don’t you people check it out yourself..Look at the clutch!! Urghhh…Cute, Cool affordable and so womanly! 🙂 Dont forget to check this out ya! Photoshop CS3 VS Photoshop CS4? Waw…September…almost end of the year 2009!! Making me busy more and more to do the next year planning for our Engineering Support team, planning, costing, expenses, performance and summary reports on all our projects…Not yet mention my daily task which need so much attention and i cannot help but hoping sometimes i can be disappear for a few minutes and… i don’t know, maybe my task will be disappear as well? The industry standard for professional photo editing, graphic design, and digital imaging. Preview, organize, search, and manage image files with the Adobe Bridge File Browser. Combines tools for painting, drawing, retouching, adding notes, and working with type. Edit images non-destructively with layer styles, adjustment layers, masks, smart objects, smart filters, and history. Automate tasks and speed up production with actions, batch processing, history tracking, and scripts. Adobe Camera Raw offers non-destructive preprocessing of Raw files from most digital cameras, plus JPEG and TIFF files. Includes tools for graphic design, Web design, video production, and photography. Extended version offers tools for film & TV, medical, science, engineering, architecture, and manufacturing fields. Besides new tools and features, this version has many user interface and efficiency improvements. Requires at least Mac OS X 10.4.11, Windows XP SP2, or Vista SP1 (excl. Home Basic) and DVD-ROM drive. Offers ultimate flexibility and more non-destructive editing features with every version. Photoshop CS4 includes many performance advances and productivity enhancing features. Supports unlimited RAM and 64-bit processing under Windows Vista 64-bit version. Price may be prohibitive for some. Buyers must choose between giving up features or paying more for the costly Extended version. GPU and OpenGL features increase the hardware graphics card requirements. No support for Windows Vista Home Basic Edition. There you go…Interesting rite :)..